Small amateur telescopes equipped with photometric filters and CCD cameras constitute a valuable tool for variable star research. 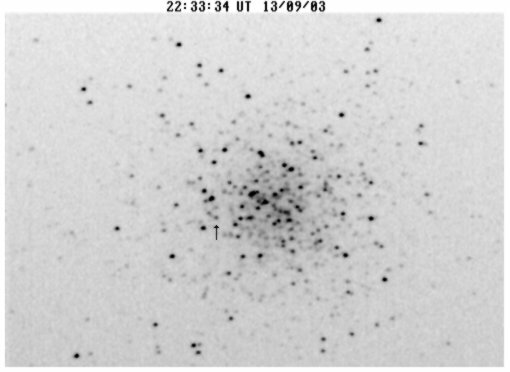 In this regard, we have carried out a photometric campaign over last three years (May 2001-November 2003), centered on the globular cluster M13 (NGC 6205). In this work, we present the results obtained from the photometric analysis of the BL Her cepheid V2 data, that can be used to estimate the distance to M13 as well as some physical features of the star. 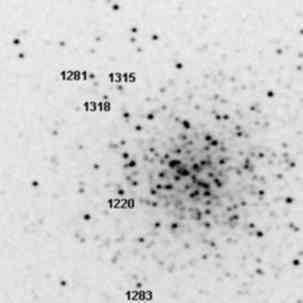 V2 in M13 is a BL Her cepheid discovered photographically as variable by Bailey in 1898 from Arequipa, Perú (Bailey, 1902). Barnard (1900) determined visually a period of about 5.10 days with an amplitude of a magnitude. Designed as L306 (Ludendorff, 1905), later Sawyer (1942) measured a period of 5.11003 days from the analysis of photographic plates. From the study of this and other cepheids in M13, a distance of 9.2 kpc, or 30000 light-years (corresponding to a distance modulus of 14.8, uncorrected by absorption), was estimated. The period of V2 was refined by Arp (1955), that provides a value of 5.11128 days, with a photographic median absolute magnitude of -1.54. An analysis of all observations since 1900 carried out by Osborn (1969) leads to a period of 5.110939 days, showing an increase of 5.5 10-8 days/day (or 20 days per million of years). Although other observers (Demers, 1971; Pike and Meston, 1977) have provided light and color curves of V2 no attempts of refining the period were performed until the work of Wehlau and Bohlender (1982), where a period of 5.11070 days is quoted with an increase of 18.0 ± 2.0 days per million of years, in agreement with the results of Osborn. 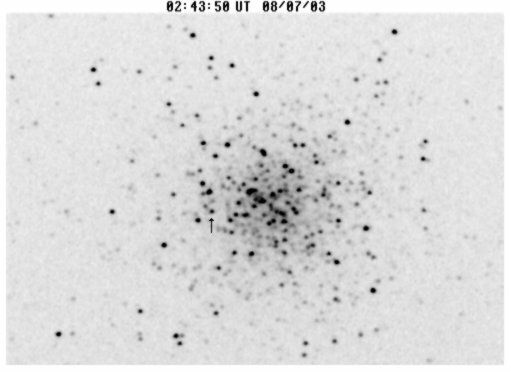 The study of its proper motion (Cudworth and Monet, 1979) confirms that V2 indeed belong to the globular cluster M13. A new determination of the period (Russeva and Russev, 1983), leads to a value of 5.110818 days. Although the variable has been studied in recent years (Osborn, 2000; Kopacki et al., 2003), no new period values have been calculated, in spite of that very complete light curves in the V and Ic bands (Kopacki et al., 2003) have been obtained (displaying an amplitude of 0.870 magnitudes and a mean V magnitude of 13.054). In this work, we have carried out observations of V2 with small amateur telescopes in order to obtain its light curve and to determine the period and amplitude of the variable. The measured period has been used to calculate the distance of the cepheid (and, hence, the distance of M13), besides of some physical characteristics of V2, as its luminosity, temperature and radius, by using empirical relations. In this work, two Schmidt-Cassegrain MEADE telescopes with diameters of 305 and 203 mm (figure 1), located in Palma de Mallorca (Islas Baleares, Spain) and Cáceres (Spain), respectively, have been used. The CCD images were obtained using a Starlight MX916 and a MX516 CCD cameras. Although some unfiltered frames were obtained, the most images were collected using a Johnson V filter. Subsequently, all the frames were dark and flat field corrected. Figure 2 shows two images with the star near of the minimum and maximum brigthness. The photometric measurements were carried out on the calibrated frames using the program IRIS (Christian Build, http://www.astrosurf.com/buil/us/iris/iris.htm), for the 2001-2002 images, and AstroArt 2.0 (MSB Software, http://www.msb_astroart.com) for the 2003 images. The reference stars used in the measurements are labelled in figure 3. A set of 211 useful magnitude estimates were obtained along the whole campaign (133 in the period 2001-2002 and 78 in the year 2003). The analysis of the photometric data was performed by means of the programs AVE 2.5 (Rafael Barberá, Grupo de Estudios Astronómicos, G.E.A.) and ISDA (Jaan Pelt, http://www.aai.ee/~pelt/soft.htm). Figure 2. CCD frames of the globular cluster M13 taken with the 203 mm telescope and the Johnson V filter. The cepheid V2 is arrowed near its minimum (left) and maximum (right) brightness. The time exposure was 45 s. North is to the bottom and east is to the right. Figure 3. Reference stars used in the photometric measurements of V2, labelled along with their V standard magnitudes. The decimal points have been omitted. As in figure 1, north is to the bottom and east is to the right. The analysis of our photometric data yields a period of 5.11168 ± 0.00021 days, in very good agreement with the results previously indicated. Figure 4 displays the light curve of V2, folded with the obtained period. In the same figure, a solid line that represent a four harmonic model fitted to the data, is superimposed. >From the best fitting model, a mean V magnitude of 13.089 ± 0.005 is obtained, also in good agreement with the literature data of Kopacki et al. (2003), 13.054, and Pike and Meston (1977), 13.10. From the model, the magnitude range is 12.683-13.545, with an amplitude of 0.862 magnitudes. This result is in excelent agreement with the value of the amplitude quoted by Kopacki et al. (2003). From the single color-period relation (B-V)o = 0.275 + 0.206 log P (Harris, 1985), a color index (B-V)o = 0.42 was obtained, in roughly agreement with the value of 0.53 quoted by Wallerstein and Cox (1984). This color index corresponds to an effective temperature of about 6630 K, according to the empirical relations of Flower (1996). Moreover, the period-luminosity-metallicity relation for the globular cluster cepheids with first-overtone pulsation (Nemec et al., 1994), as it is suggested for V2, leads to a mean V absolute magnitude of -1.51. Using a reddening of 0.03 for M13, and the mean V magnitude of 13.089 above indicated, we have calculated a distance of 8.0 kpc, in good agreement with the value of 7.7 kpc of Harris (1996) for the distance to M13. In this regard, from the bolometric correction of 0.015 for a color index of 0.42 (Flower, 1996), the mean absolute bolometric magnitude of V2 is -1.49. From this value, we obtain for V2 a mean luminosity of 316 times the solar luminosity (assuming that the absolute bolometric magnitude of the sun is 4.76). This result, according to the luminosity-radius-temperature relation derived from the Stefan-Boltzmann law, leads to a mean radius for V2 of about 13 solar radii. Although these results must be considered with caution, owing to the uncertainties associated with the empirical relations used, they provide estimates of physical parameters of the star that are in rough agreement with the features expected for a W Virginis variable. In regard with this, the luminosity and color index of the star agree with the results of the literature, and the estimated distance is very close to the value accepted today for M13. Figure 4. Light curve of V2, from the 211 observations collected in this study. Solid line is a four harmonic model fitted to the data. Digital technology has opened a wide field of possibilities for the amateur astronomy. In particular, amateurs with small telescopes (20-40 cm), low-cost commercial CCD cameras and appropriate software tools, can contribute with accurate data to the photometric study of many interesting stars, even from the polluted skies of our cities. 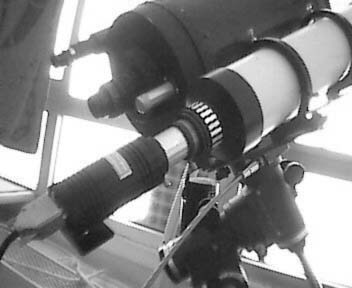 As we have shown in this work, an amateur modest equipment can provide results that are comparable with those obtained in professional astronomy. In our case, in spite of the relative low apparent luminosity of the star (mV = 13), a careful analysis of the photometric data of the cepheid V2 in M13 can be used to estimate the distance to the variable, its absolute luminosity, temperature and radius. This star has been extensively studied by many authors, but there are a considerable number of variables relatively bright with poor light curves that can be used as targets in photometry. 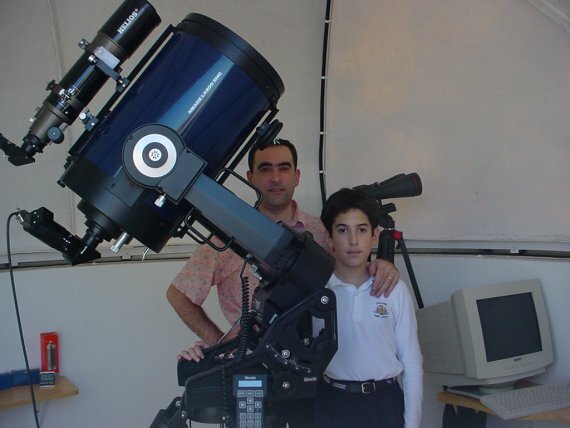 In this way, amateur astronomers can do valuable contributions to research in photometric astronomy (as, in fact, they are doing currently for many variable star types -from eclipsing binaries to long period variables-). We would like to thank Dr. Wayne Osborn for his assistance and guidance, and Josep M. Gómez (Grupo de Estudios Astronómicos, G.E.A.) for his helpful comments that improved this study. The NASA ADS Abstract Service was used to access data and references. The observational data used in this work are available upon request to Francisco A. Violat Bordonau (fviolat@yahoo.es). Arp, H.C.: 1955, AJ 60, 1. Bailey, S.I. : 1902, Harv. Ann. 38, 1. Barnard, E.E. : 1900, ApJ 12, 182. Cudworth, K.M., and Monet, D.G. : 1979, AJ 84, 774. Demers, S.: 1971, AJ 76, 445. Flower, P.J. : 1996, ApJ 469, 355. Harris, H.C.: 1985, in Cepheids: Theory and Observations , IAU Colloquium Nº 82, edited by B.F. Madore, Cambridge University Press, p. 232. Harris, W.E. : 1996, AJ 112, 1487. Kopacki, G., Kolaczkowski, Z., and Pigulski, A.: 2003, A&A 398, 541. Ludendorff, H.: 1905, Publ. Astrophys. Obs. Postdam 15, Nº 50. Osborn, W.: 1969, AJ 74, 108. Osborn, W.: 2000, AJ 119, 2902. Pike, C.D., and Meston, C.J. : 1977, MNRAS 180, 613. Russeva, T., and Russev, R.: 1983, Peremennye Zvezdy 22, 49. Sawyer, H.B. : 1942, Publ. David Dunlap Obs. 1, 231. Wallerstein, G., and Cox, A.N. : 1984, PASP 96, 677. Wehlau, A., and Bohlender, D.: 1982, AJ 87, 780. Enter the forum and ask your questions to the author!